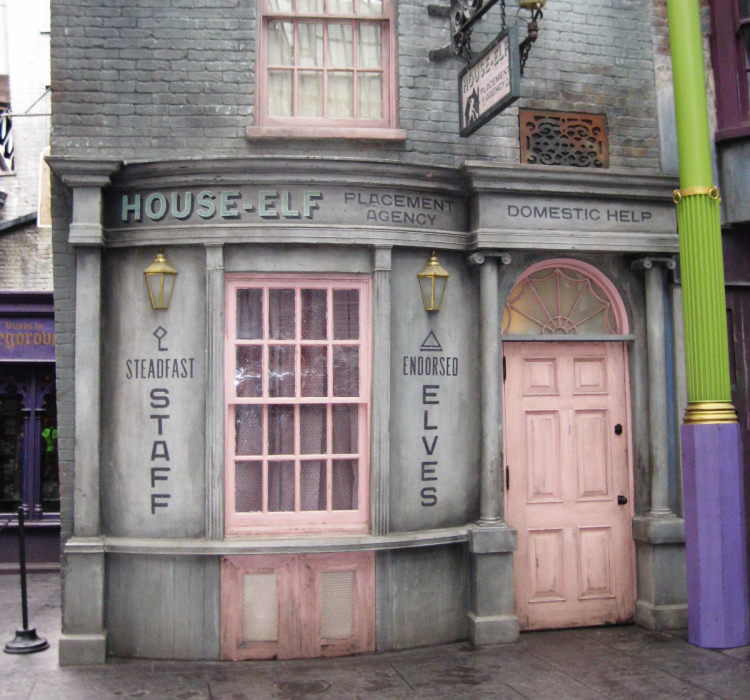 After a few weeks of construction around the House Elf Placement Agency, a new store was revealed at the Wizarding World of Harry Potter in Orlando. 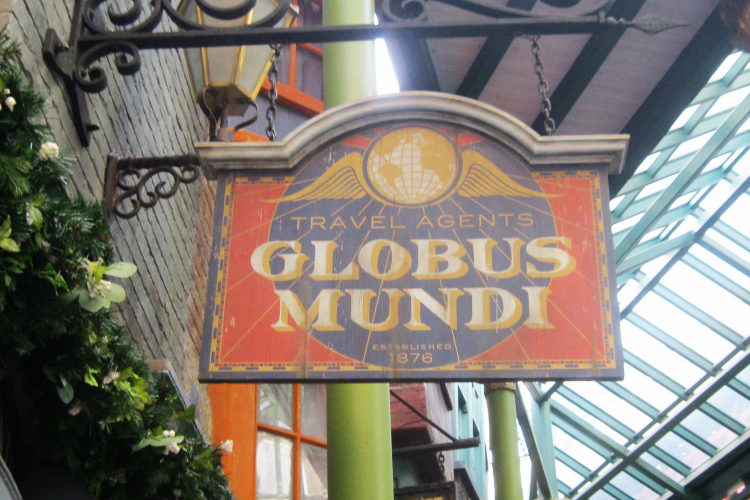 Just around the corner from the Wands by Gregoravitch shop (and across from the Carkitt Market stage where Celestina Warbeck performs), fans can now visit a new 'travel agency' Globus Mundi - latin for World of the Globe. 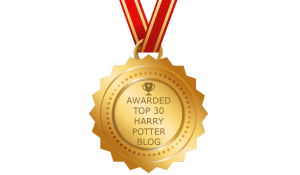 Here's an old look at the House Elf Placement Agency. 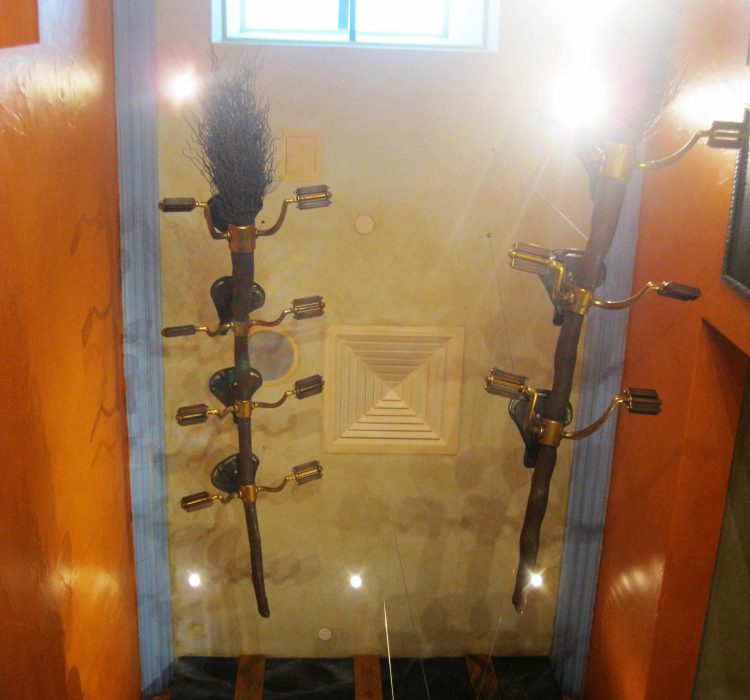 While the 'office front' was a cool backdrop for witches and wizards on social media, it wasn't a featured attraction or 'store'. Here's a look at the new store front cleaned up, repainted, and sporting an street-cone orange decor. 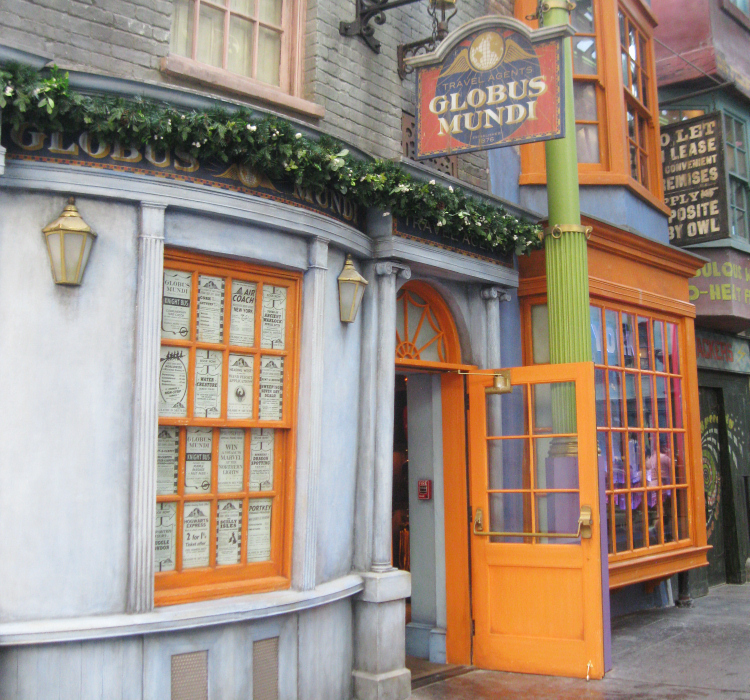 It definitely stands out from the rest of the store fronts in Diagon Alley. 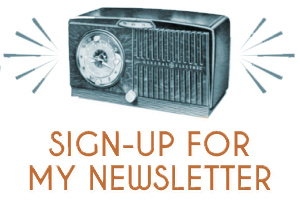 Take a closer look at the rest of the store behind the cut! 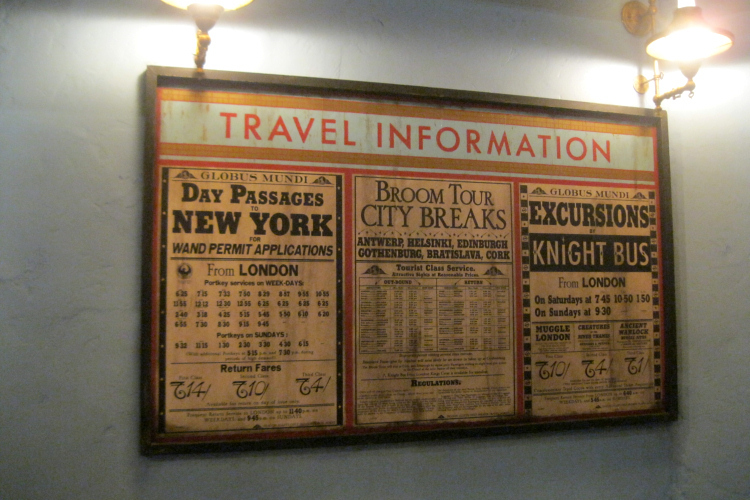 In the books, we got a taste of what travel was like in the wizarding world from the Hogwarts Express departing Platform 9 3/4 to Hogwarts, the floo network, flying by broomstick, and apparating. 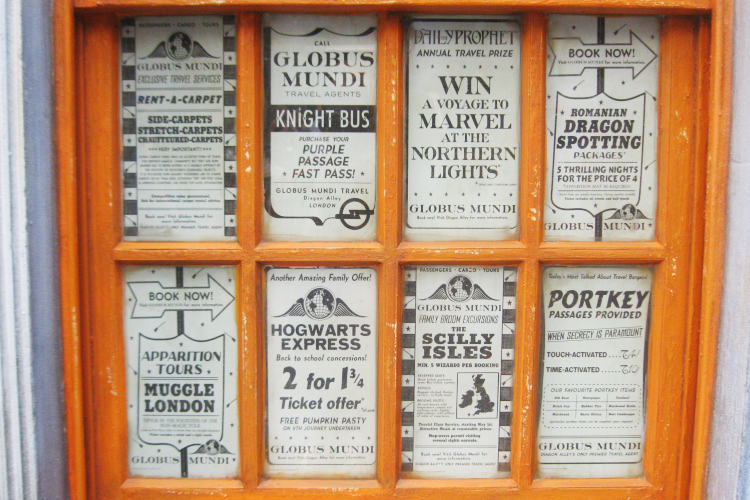 Here, with a closer look at the windows, flyers show there's even more ways to travel - all kinds of tours and deals witches and wizards can make no matter how they want to jettison around the world. Water Creature Guided Tours - Exclusive Sightings Arranged - The Loch Ness Monster - The Kraken - Mermaids & Mermen and More! 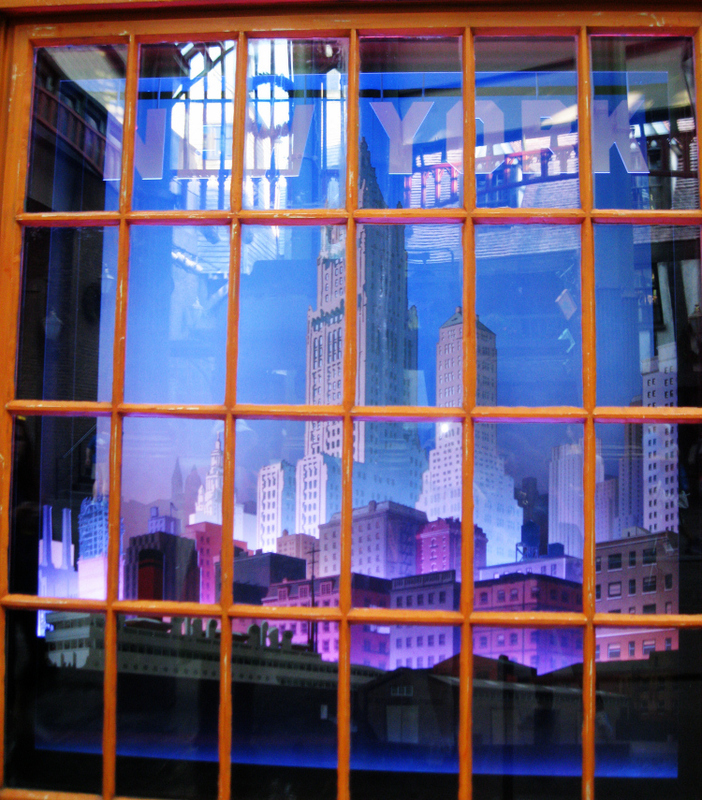 On the other side of the store's windows was a glowing display of the New York skyline - very retro! 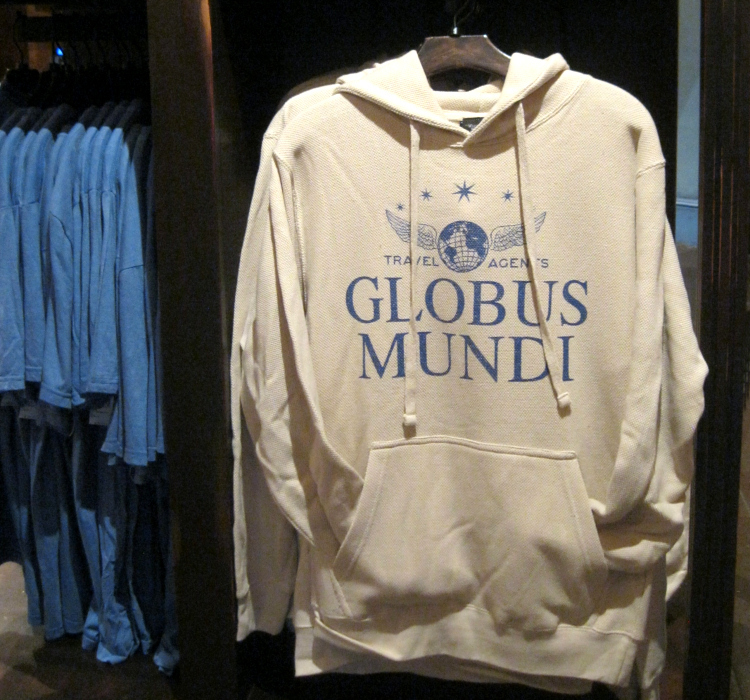 The Globus Mundi store is pretty small, but like everything else in the wizarding world theme parks, there's plenty of detail to catch your eye. 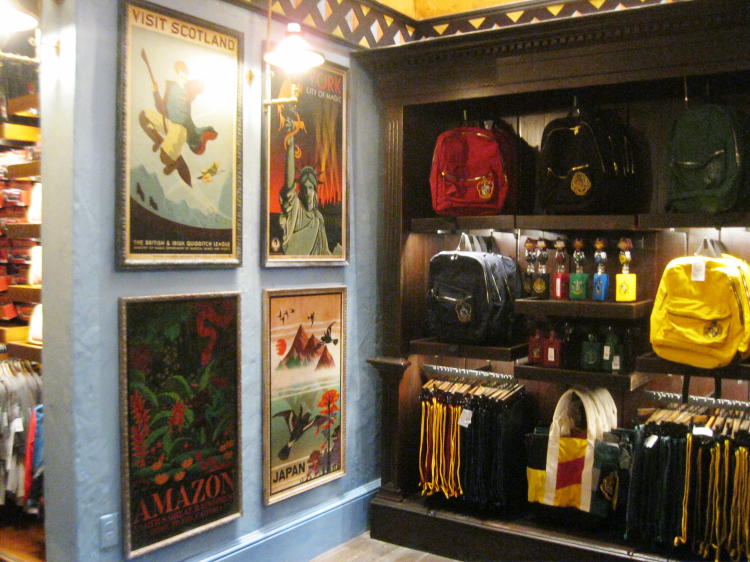 The first is a shelf with new products like house theme backpacks alongside vintage-styled travel posters. 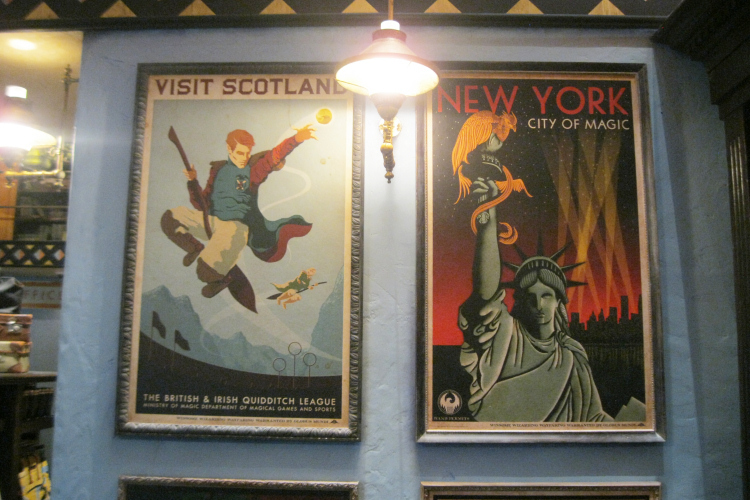 It's fun to get a different view of the wizarding world from the Amazon to Japan...while we've 'visited' Scotland (where Hogwarts is located) and New York (in Fantastic Beasts and Where to Find Them) before. 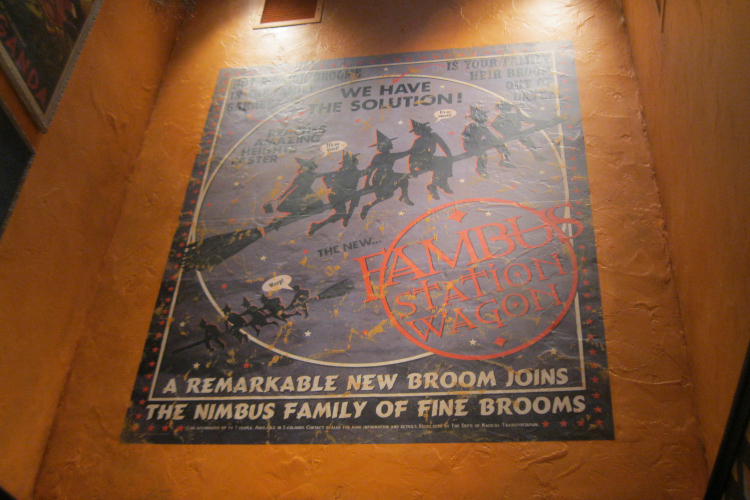 You can get a closer look at what the Fambus Station Wagon looks like on the actual ceiling. 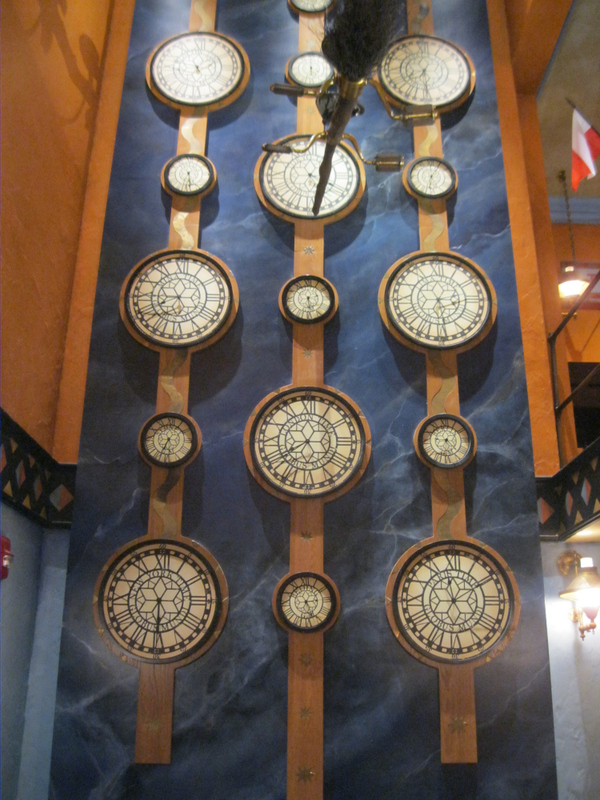 And there's no missing this big wall of clocks that are counting the minutes away in wizard communities around the world - New York, Paris, Beijing, London, Sydney, Berlin. 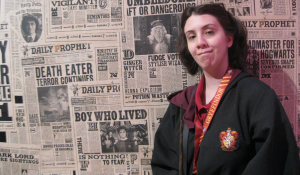 The decor is complete with a dash of the iconic Harry Potter stars from the books too. 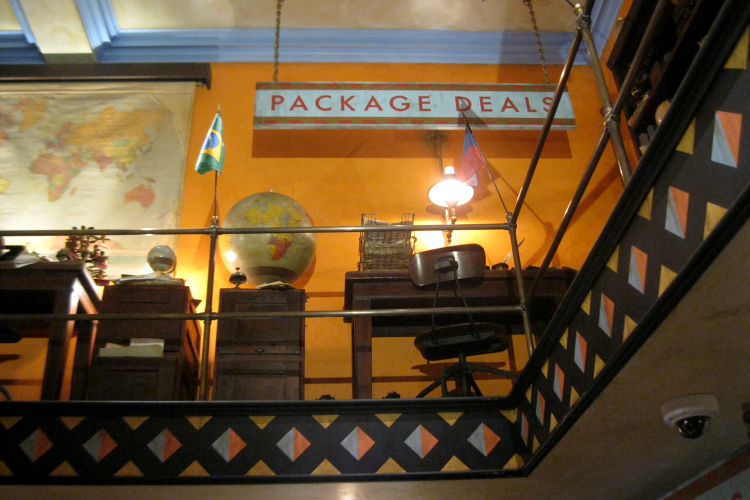 Further into the store you can see even more details like a second floor filled with desks and world globes, the ticket office (or cash register), world flags, and travel information. The travel agency has some pretty great merchandise with the store's insignia on it including t-shirts, passport holders, mugs, and hoodies. 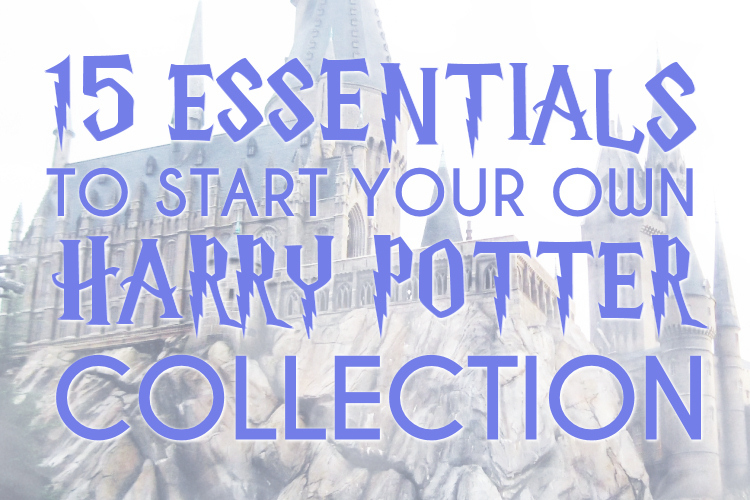 Most of the other merchandise is Hogwarts or house-themed. Globus Mundi is an interesting choice for a new store since it's not tied to a stand-out moment in the Harry Potter or Fantastic Beasts series so far. 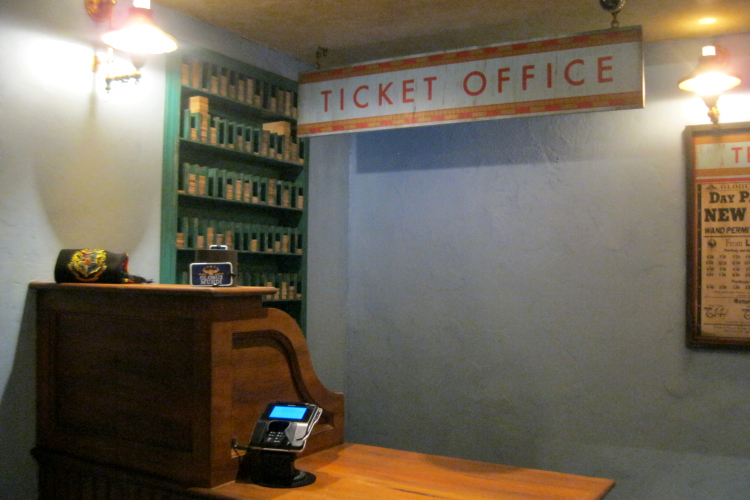 But the store gets a lot of from guests who love the merchandise and the mystery of what it stands for. 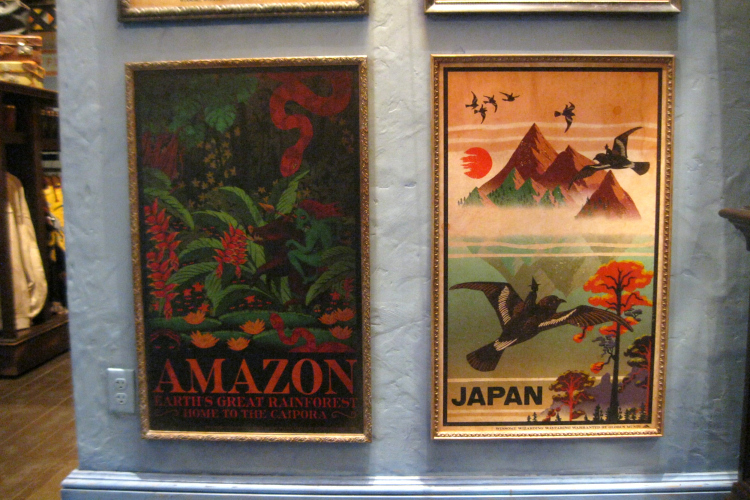 As the Fantastic Beasts series starts to take us further around the world than we've been before, it'll be interesting if more international collectibles come along. 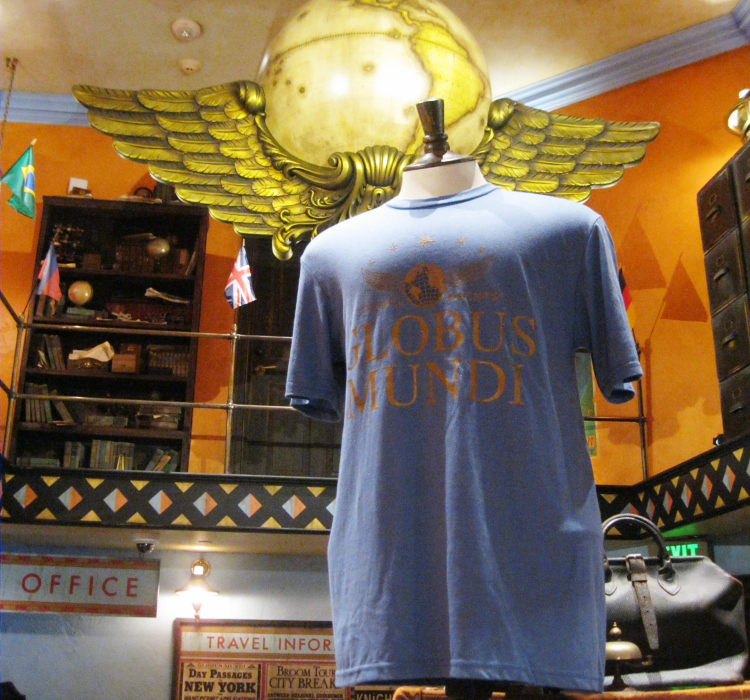 If you're looking for another amazing shop to visit at Diagon Alley in Wizarding World of Harry Potter in Orlando, be sure to check out Globus Mundi.